Secured graphic design with privacy control. How much does Venngage cost ? The pricing for Venngage starts at $19.0 per month. Venngage has 2 different plans such as - Premium at $19.0 per month and Business at $49.0 per month. 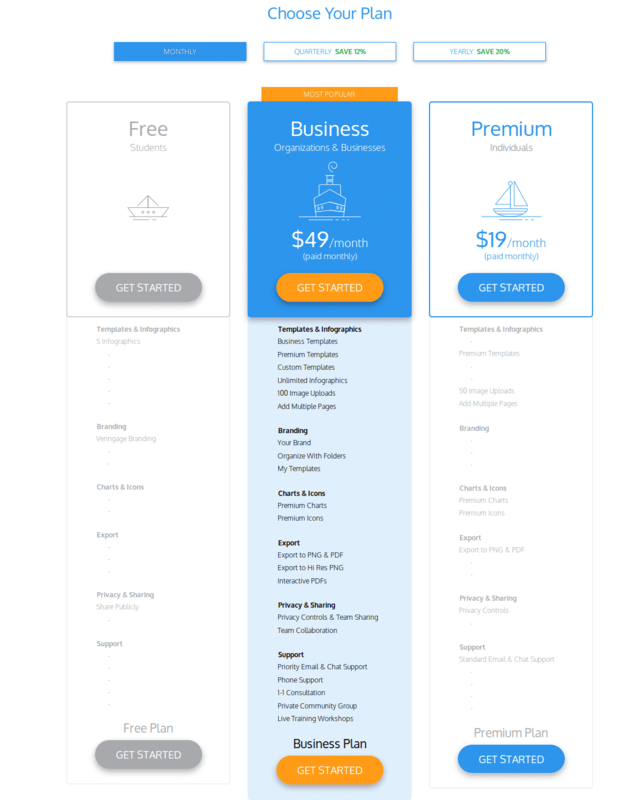 Venngage also offers a Free Plan with limited features. 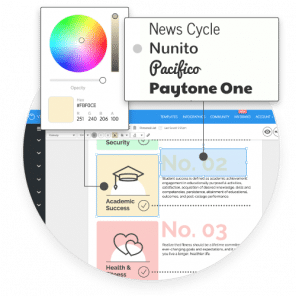 Pros: Venngage has a great selection of templates, and it's very simple to customize the graphics to suit your business. It is also much easier to create graphs with this software compared to other programs I have tried in the past. Cons: Working with layers can be tricky, and the font choices are limited, but overall I have no complaints! Overall: Venngage is very easy to learn, and a great resource for small businesses. It helps us to create great looking infographics without help from a graphic designer. 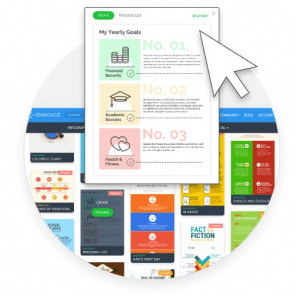 Pros: Very easy to use, low learning curve, lots of templates and design tools. Cons: Free versions restrict the downloading of infographics. You have to upgrade to download as a JPEG or PDF. Pros: The large library of templates of which you can easily adapt for your intended purpose. Cons: The lack of functionality without paying for the premium subscription, like downloading the files you need but as long as you're online for presentations or showcasing to customers then you'll be a-okayyy! Overall: I'm working through it slowly and finding great ways of creating visual aids ie inforgraphics to explain different parts of my business or and communicating the right message to the right customer in an easy way. Overall: I use the product to create infographics for my consulting and training firm to promote our training workshops or to post on our website or Facebook. Once the research is done, I can knock out one in an hour or so. 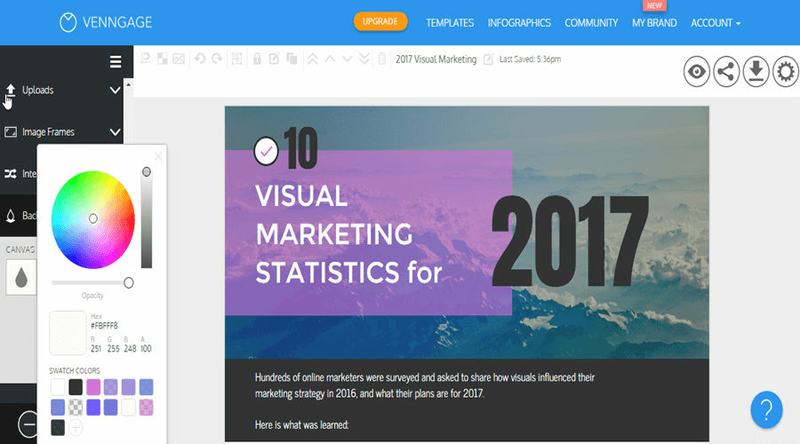 Pros: It is relatively easy to put together an infographic using this software. 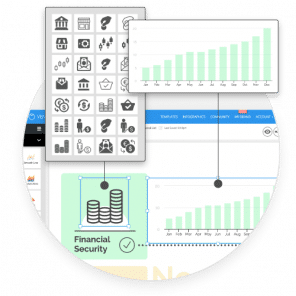 Having spreadsheet-like capability when importing data is useful and an easy-to-read infographic can be created very fast. Cons: Infographics tend to not be pleasing to the eye even when utilizing their templates. The visual elements in the library are very basic and although it is possible to import your own, it adds a lot of time to the design. I also think the software has issues when it comes to alignment. The crosshairs confirming that an element is centered always seem to be off by 5-10%. 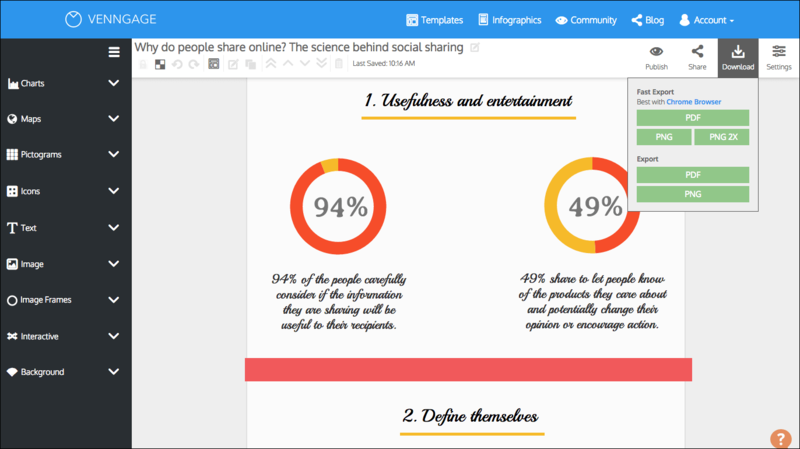 Overall: My marketing team uses Venngage when creating quick infographics for content marketing and social. Shouldn't have to pay more to better organize "me designs"